As we become more attuned to Life itself, our consciousness begins to shift from the outer, physical, keyboard world to the inner world of bio-microchips, soul-modems, and spirit-interface. Yes, fellow bio-computers, its time to do some preventive maintenance to optimize those inner devices and get that personal database managed, so you can flow with the upcoming Soulic programming download. Let's not forget to check out our bio-hard drives for faulty programs and those nasty viruses that get into our mental microchips and ruin the data. You know, those files containing negative beliefs and attitudes that keep popping up on the screen by mistake, producing system-wide failures. First, shut down. Get still. Take your eyes off your outer world screen and focus inward. Choose a few programs in your life that arent producing positive results ~ your love life, your job, your health ... pick some. Good. Now remove all those faulty programs, files and data ... see them moving into a space about 18 inches in front of you. Thats it ~ collect and upload all of them. Now, watch as the akashic file repair technician magically appears before you and picks up all your corrupted files. The tech whisks them to a nearby overhaul facility, and if your data is beyond repair, they press the handy delete button. They then run the files forward and back, scan them, and if irreparable, erase them into the trash. Most corrupted data is beyond repair, so now that its all been removed a new Master Program will be perfectly designed, just for you. Heres how it works. 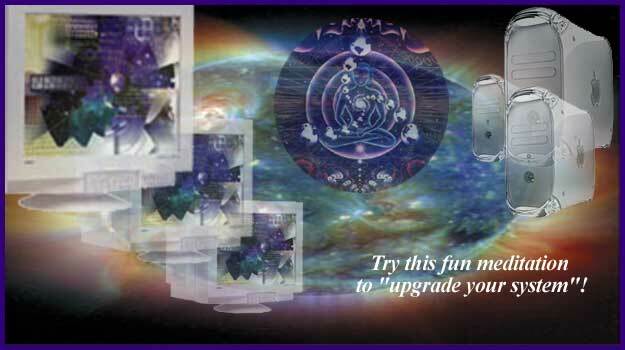 The akashic technician zooms over to the cosmic user-group and obtains the master disk for your program, made by the Master User themself, who makes copies from the online master programs and brings the new ones to you for your bio-computer. The Master User thoroughly cleans out the expired entries from your old system, then installs a bio-microchip in your main drive to prevent any viruses from contaminating your new data. They expertly install the new data into place ... click, and click. There ~ now watch your new disks spinning around and around in the bio-computer. Click, zing, whiz, click. Breathe in and fill up with your new, perfect program. One last word: dont bother looking around for those old, negative thoughtforms and corrupted filings ~ they have been permanently deleted and repaired. Bingo, youve now got copies of the perfect upgraded Master Program!